It has been a pretty memorable gardening year – having converted so much lawn into garden, we’ve had more produce around than ever, both in quantity and diversity. An unexpected treat at the end of the season is these guys – dried beans. I suppose it’s relevant that I am a big fan of dried beans, and have a soft spot for white beans as I grew up eating my french grandfather’s version of what he grew up on, which itself originated in Vendée, France. His grandparents likely were fiercely proud of the now scarce and very pricy Mogettes de Vendée. I once found some in a lovely dry goods shop in Paris, but otherwise have never seen them around. I grew up hating my grandpa’s beans as most kids seem to, but I’ve been reformed, as most adults seem to be. I found the seed for these here a couple years ago – last year was a bust. But they’re easily one of the most visually stunning items to come from the garden this year. I particularly like the ‘orca”s appearance, shown below. My intention, other than cooking and eating them, has been to figure out which do best in my yard, save seed, and move forward from there. If you’re thinking I’m a bit nuts, the guy who nominated me for ‘Front Yards In Bloom‘ [which I believe Maki rocked this year] lives only a few blocks away, and is apparently an avid dried bean collector. Geeks come in all kinds, and I appreciate them all. Where were they growing? Do you have a photo of the plant? Think you are nuts? NO. Think you are thorough? Yes. 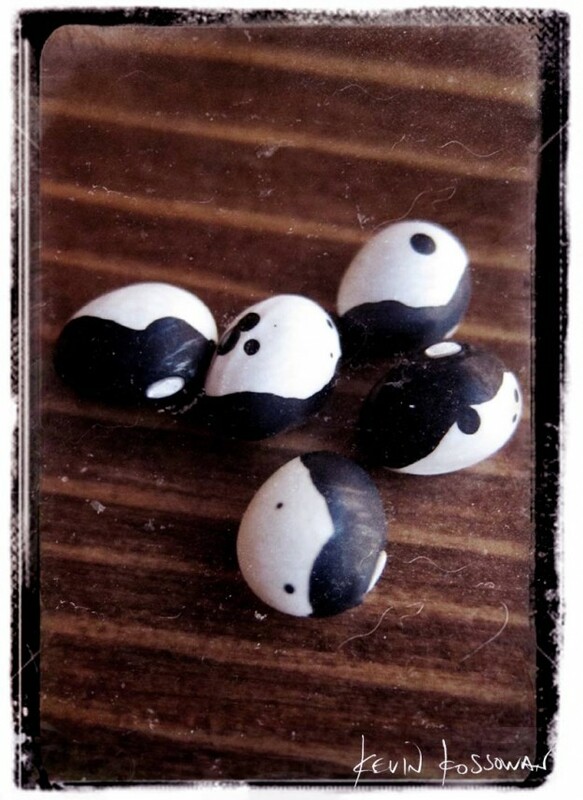 Never seen the YING YANG bean before. Can’t wait to taste it – once you get a good crop. Is your yard big enough for your garden ideas? 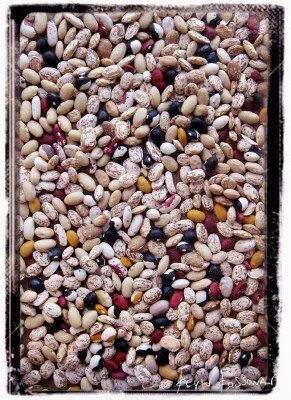 I really like scarlet runner beans and mitla black tepary beans . They are two must haves in my garden. The tepary bean has a lovely purple flower. I have those orca beans too – and some brown ones that are similar. I got a mixed set of heritage beans from Salt Spring Seeds, and they are really fun to grow. Hopefullly next year they will ALSO be fun to harvest! They are so beautiful. I harvested mine while at the “string” stage and froze them. Now I wish I had waited. This was a good year for my beans. Not so much for my tomatoes: the crazy fungus got them.